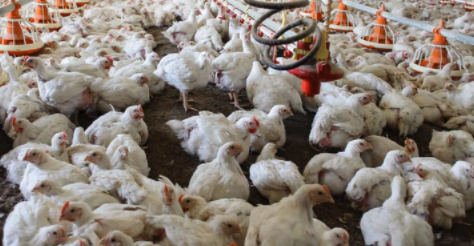 Bioavailability of Nitrogen in Poultry Litter following PLT Application – Jones-Hamilton Co.
Poultry litter is recognized as an excellent source of plant nutrients (nitrogen, phosphorus and potassium) and organic matter. Nitrogen (N) is excreted from birds in the form of uric acid in the manure. Inorganic forms of N such as ammonium nitrate (NH4-N) and nitrate nitrogen (NO3-N) account for roughly 14% of the total litter N. The remaining 86% of the total litter N is in the form of organic N. This paper details research that supports the fact that PLT® use increases litter N content by reducing ammonia volatilization, increasing ammonium nitrogen and forming ammonium sulfate. Poultry litter is recognized as an excellent source of plant nutrients (nitrogen, phosphorus and potassium) and organic matter. Nitrogen (N) is excreted from birds in the form of uric acid in the manure. Inorganic forms of N such as ammonium nitrate (NH4-N) and nitrate nitrogen (NO3-N) account for roughly 14% of the total litter N.
The remaining 86% of the total litter N is in the form of organic N (Sharpley et al., 2009). Litter N may also be found in the form of ammonia. Ammonia, a colorless, highly irritating gas, is formed through the microbial decomposition of uric acid. Ammonia levels above 50 ppm are detrimental to both bird and worker health. Litter pH, moisture content and temperature play an important role in the rate of ammonia volatilization; increasing any of these variables increases volatilization. Low litter pH converts ammonia (NH3) to ammonium (NH4) which prevents volatilization. As litter pH increases, ammonia concentration increases. Uric acid decomposition, by the enzyme uricase, is most favored under alkaline (high pH) conditions. Proper poultry house ventilation and litter management can be used to control ammonia levels. Sodium bisulfate (PLT® litter acidifier, Jones-Hamilton Co.) is commonly used in poultry houses to reduce harmful ammonia emissions, offering a better in-house environment for both birds and growers. PLT® works by lowering litter pH, creating a neutralizing effect on the ammonia released. PLT® accomplishes this task by releasing hydrogen ions (H+) that will attach to ammonia to form ammonium which further reacts with sulfate ions (SO4) to form ammonium sulfate (NH4)2 SO4, a water soluble nitrogen fertilizer. These reactions reduce ammonia losses from poultry litter, which can result in an increase in litter N content. 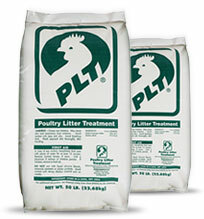 For every 100 lbs of PLT® applied to poultry litter, 14.5 lbs of ammonia is chemically bound as ammonium sulfate. The formation of ammonium sulfate is non-reversible; therefore, the nitrogen in the litter is not released as ammonia when the pH increases. 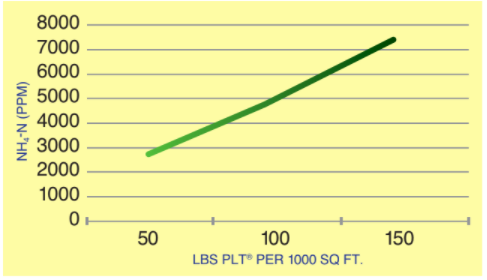 For every 100 lbs of PLT® applied to poultry litter, 14.5 lbs of ammonia is chemically bound as ammonium sulfate. The formation of ammonium sulfate is non-reversible; therefore, the nitrogen in the litter is not released as ammonia when the pH increases (Ullman et al., 2004). Following poultry litter land application, inorganic, water-soluble forms of litter N such as ammonium sulfate (formed by PLT®), ammonium nitrogen, ammonium nitrate and nitrate nitrogen are transported into the soil by rainfall and are readily available for plant root uptake (Havlin et al., 2005). Organic forms of N are considered slow release fertilizers and are not immediately available for plant uptake. Organic N must first be mineralized by soil microorganisms prior to becoming plant available. Mineralization is a process of converting organic compounds to inorganic compounds. The following research supports the fact that PLT® use increases litter N content by reducing ammonia volatilization, increasing ammonium nitrogen and forming ammonium sulfate. Published research from the University of Delaware has shown that litter pH and ammonia levels were decreased following repeated PLT® application to broiler litter in both laboratory and field experiments. Furthermore, organic nitrogen and total nitrogen contents were higher in PLT® treated litter compared to untreated litter. This is due to the fact that PLT® reduced ammonia loss (Li et al., 2013). Figures 1 & 2. Amount of retained total nitrogen and ammonium nitrogen (NH4-N) in broiler litter after three flocks of PLT® usage on re-used litter. 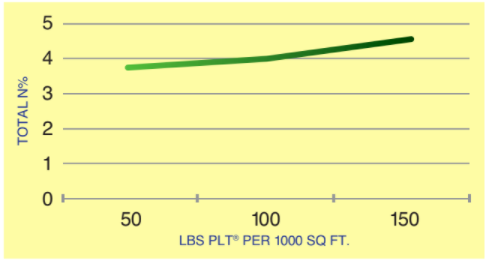 PLT® usage was tested in a high-rise commercial egg layer facility for the reduction of ammonia (Patterson et al., 2006). Because layer manure does not contain a plant substrate, as does broiler litter, the moisture and ammonia content tend to be greater. Repeated applications of a litter amendment at higher rates are often necessary before significant changes in manure characteristics are observed. Manure total nitrogen and ammonium nitrogen (NH4-N) were higher in PLT® treated manure compared to untreated manure (Table 1). Table 1. Commercial Layer Manure Analysis after 8 PLT® treatments over a 45-day period. Roughly 86% of poultry litter N is found in the organic (slow release) form while the remaining 14% is inorganic (fast release) N.
Ammonia losses from litter are reduced following PLT® application. PLT® reduces ammonia volatilization by forming ammonium sulfate and increasing litter ammonium N.
Ammonium sulfate and ammonium N are inorganic, water-soluble, nitrogen fertilizer sources readily available for plant root uptake. Research has shown that total nitrogen and ammonium N levels are higher in PLT® treated litter compared to non-treated litter. Havlin, J., J. Beaton, S. Tisdale and W. Nelson. Soil Fertility and Fertilizers. 7th Edition. pp. 146-151. Johnson, T.M., B. Murphy, R. Chick, B. Fairchild, and C.W. Ritz, 2006. The use of sodium bisulfate as a best management practice for reducing ammonia and VOC emissions from poultry and dairy manures. Proc. International Workshop on Ag. Air Quality. Potomac, MD. 786-794. Li, H., H. Lin, S. Collier, W. Brown and S. White-Hansen, 2013. Assessment of frequent litter amendment application on ammonia emission from broiler operations. J. of Air and Waste Mgmt. Assoc. 63(4):442-452. Patterson, P., T. Cravener, C. Myers, G. Martin, and A. Adrizal, 2006. The impact of sodium bisulfate (PLT) on hen manure, ammonia emissions, and flies. Proc. 2006 SPSS/SCAD Annual Mtg. Atlanta, GA. 33. Payne, J. B., E. C. Kroger, and S. E. Watkins, 2002. Evaluation of litter treatments on Salmonella recovery from poultry litter. J. Appl. Poult. Res. 11(3):239-243. Pope, M.J. and T.E. Cherry. 2000. An evaluation of the presence of pathogens on broilers raised on Poultry Litter Treatment (PLT) treated litter. Poultry Science. 79: 1351-55. Sharpley, A., N. Slaton, T. Tabler, K. VanDevender, M. Daniels, F. Jones, and T. Daniel, 2009. Nutrient analysis of poultry litter. https://www.uaex.edu/publications/PDF/FSA-9529.pdf Accessed November 2017. Ullman, J.L., S. Mukhtar, R.E. lacey, and J.B. Carey, 2004. A review of literature concerning odors, ammonia, and dust from broiler production facilities: 4. Remedial Management Practices. J. Appl. Poult. Res. 13: 521-31.